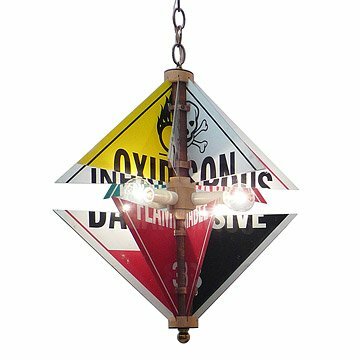 This contemporary table lamp is made from reclaimed hazard signs, giving it colorful graphic appeal. Don't heed the warnings: this hard-core light fixture only poses a danger to drab decor. DesignerJeff Subik loves juxtaposing traditional decorative forms--in this case, the classic chandelier--with unexpected materials. Reclaimed hazard signs lend the piece bold colors and iconography, for a look that lights up a room in more ways than one. Handmade in New York. Jeff Subik launched his furniture and lighting company, Modernrustic.com, to create one-of-akind housewares from mostly reclaimed and repurposed materials. Drawing on years of experience as an Art Director for Theater, Television and Film, Subik uses his love for found objects to produce unique pieces dedicated to the concept of upcycling. 19.5" H x 17" dia. Wipe metal components with a damp cloth. Do not clean inside socket with water. Bulbs included. Max bulb wattage: 40 watts each socket. Due to reclaimed nature of the materials, some variance is to be expected as well as normal wear and tear of the hazard signs. I bought this for my son's room and I love it. It's high quality, whimsical and unique and can travel with him to college and after. As a parent I do everything I can to keep my child from harm so I think it's a tiny bit funny to look up at this light and see "Toxic" and "Danger" when I'm reading him his bedtime stories. I also love that it's made from upcycled materials that themselves have some historical value as time marches on . . . who knows what delivery trucks will look like when he's an adult! I love the idea that this light fixture can follow my son as he grows and remind him of his youth. It's fun and whimsical but also has a sophisticated, wry timeless air to it. I also personally think it's a funny in-joke for me ... As a parent all we try to do is protect them from danger and harm so to hang a light that says "toxic" and "danger" seems just about right.